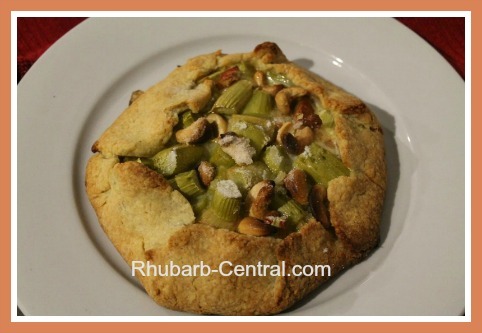 Check out this Rhubarb Tart Recipe and pictures! Verena from New Zealand, submitted this recipe and pictures for others to enjoy! 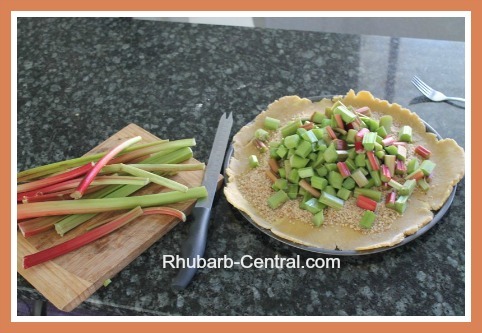 Here is how to make the this tart, the Best Swiss Rhubarb Pie or Tart, Rhabarber Waehe, you will love it! You can also make this tart recipe with plums, apricots or Granny Smith apples. 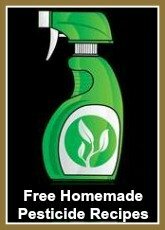 Serve plain, or add a dollop of whip cream! 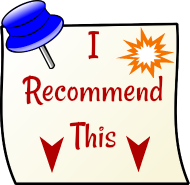 Thanks for sharing this recipe and pictures Verena! 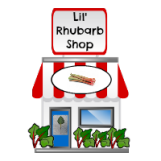 Verena used fresh rhubarb for this recipe. Frozen, thawed rhubarb would probably work as long as it is not too "wet". If you decided to make this tart with frozen rhubarb, thaw it first, in a sieve over a bowl, and discard the excess liquid. 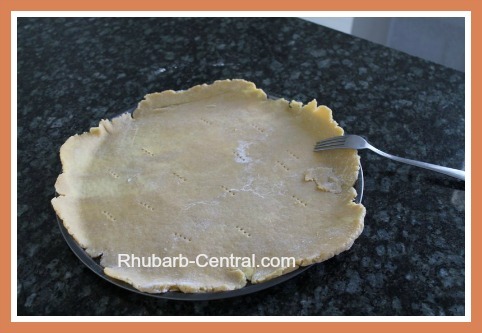 Using a pastry rolling pin, roll out the pastry and transfer to a baking pan. Use a fork to prick the pastry in several places (see picture below). 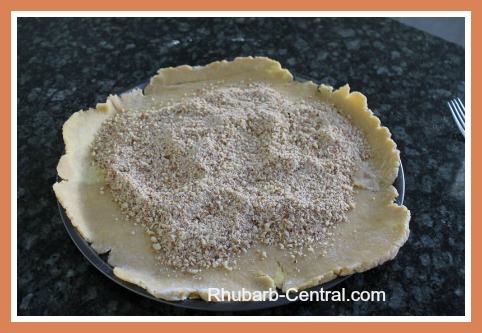 Sprinkle the ground hazelnuts or almonds on top of the pastry - enough to make the layer about 1 cm. high (see pictures). Add the chopped rhubarb on top of the ground nuts. 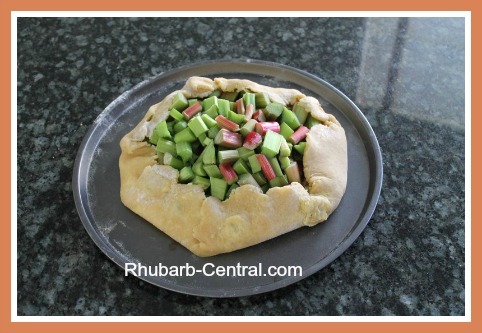 Don't add too much, if you put too much rhubarb on it may turn soggy(see picture). Carefully flip the edges up and over the filling a little (see picture). 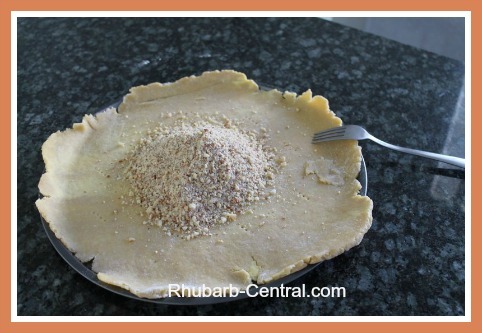 Pour a mixture of the 150 ml full cream, 2 tablespoon sugar and 1 egg on top of the rhubarb filling. Bake at 200 °C (400 ° F ) for about 20 - 30 minutes or until done. If a more sweet tart is desired, sprinkle with a little sugar after baking. Serve warm or cooled, plain or with a dollop of whipped cream. Verena likes to cashew nuts on top for an extra special treat!